When the Mets approached the American Indian Community House, a New York-based nonprofit organization, in March about helping to organize a Native American Heritage Day, the proposal struck members of the group as a good opportunity to celebrate their involvement in the community. A date was selected — July 25 — and they began to plan pregame festivities that would include traditional dancing and singing outside Citi Field. On [July 8], the A.I.C.H. pulled out of the event, citing frustration with the Mets for thwarting months of planning. The team has removed the event from its online schedule of activities. Tarrant said his group originally hoped to hold the festivities in early June so that the game would coincide with an area powwow, a traditional American Indian gathering. But with the Mets on a road trip that week, the group suggested July 25 as another option. It was a 12:10 p.m. game, Tarrant said, which meant more children were likely to attend. Also, another powwow was planned for the following weekend in Queens. That the Mets were scheduled to face the Braves that afternoon was coincidental, Tarrant said, though the group was not so naïve as to ignore the political overtones. Various groups have criticized the Braves for their use of American Indian imagery, in particular the team’s Tomahawk Chop chant. The Mets official wrote in the e-mail that the Braves had nothing to do with the decision. (Emphasis added.) The full article is available here. Other, more common guests have been absent from the Braves scene in recent days as well. 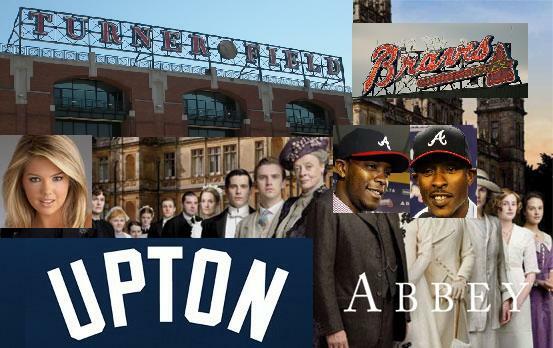 Right before the all-star break, Atlanta’s celebrity outfield squad knocked itself out in the span of two days, when Jason Heyward and B.J. and Justin Upton all went down with leg injuries. Most recent, gruesome, and serious of all, though, was starting pitcher Tim Hudson, who had his ankle destroyed by a Met baserunner while covering first base. The injury will end Hudson’s season. Pitcher Kris Medlen is still around, but he’s not the Kris Medlen the team knew last year, and that is cause for concern as well. Evan Gattis is back in action, though, and he should get used to eating dinner with this team. While manager Freddie Gonzales hasn’t quite found a consistent spot at the table for Gattis, el Oso Blanco should squeeze in and enjoy some of those new waffles; with starting catcher Brian McCann possibly set to leave after this season, Gattis could find himself with a regular seat at the plate in 2014. This entry was posted in ALDLAND and tagged atlanta, b.j. upton, braves, brian mccann, evan gattis, fangraphs, jason heyward, justin upton, kris medlen, mets, mlb, new york, new york times, sports on earth, tim hudson by AD. Bookmark the permalink.